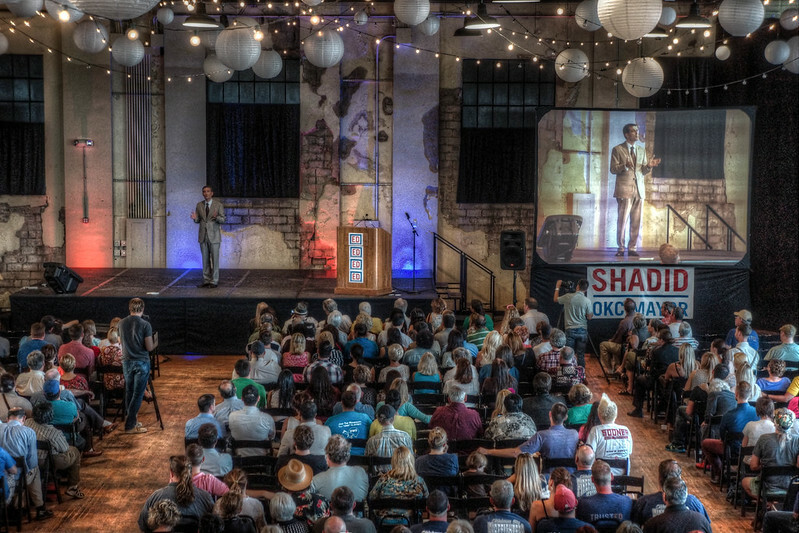 Ed Shadid launches into his bid for OKC mayor Thursday night at the Old Farmers Market Public building. Photo by Brandon Isaak. 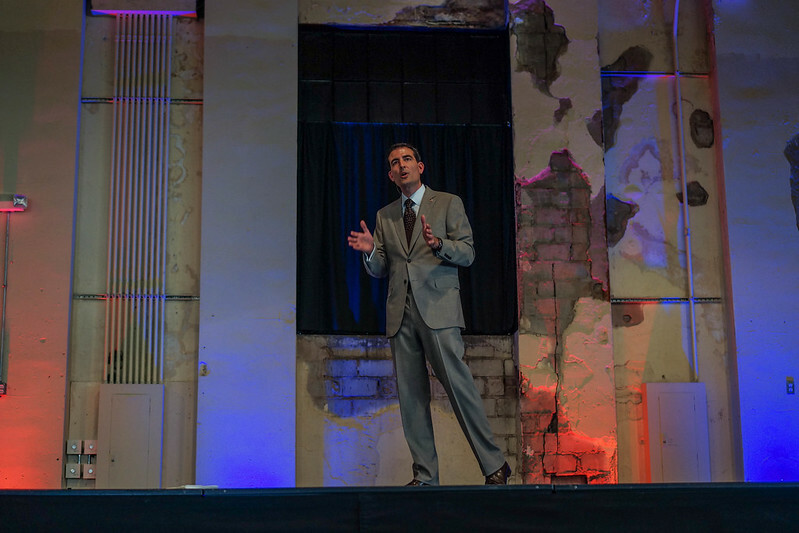 City Councilmen Ed Shadid took the stage last night to have a conversation with around 1,100 people about why he should be Oklahoma City’s next mayor on March 4, 2014. That’s nearly double the attendees who went to Shadid’s transportation symposium. And while transportation was a topic of discussion, it wasn’t the only agenda item Shadid wanted to discuss with the crowd. Highlights from his speech included health care, addressing community building (emphasis on accessibility, creating a unique sense of place and hubs of activity – like H&8th), pitfalls he’s seen in local government, and how we might start to address shortcomings in spending and prioritization. Think: political transparency. He said that change is coming regardless who is the mayor, because all along the I-35 and I-40 corridor cities, such as OKC, are experiencing a boom in economic growth. And while he sees that people are coming together to shape that change and make it more meaningful, purposeful, and inclusive, he noted that 96% of OKC’s population did not vote in the last mayoral election. That is to say the mayor only won by 14,000 votes cast out of 24,000. Even so, he believes voter turn out will be higher this next election cycle because there is undeniable sense of growing momentum. There were a few troubling facts he ticked off too. This had not only to do with transportation (where about 100,000 people rely on what passes for public transportation in Oklahoma City), but with how government spending works at the local level and that many neighborhoods consistently report that their communities feel left out of all this momentum to improve and revitalize the city. For example, many neighborhood parks are cutting back services because they lack funding to keep basic amenities maintained. Meanwhile new city projects are not being financially planned well enough to sustain operation costs after the initial investment has been made. Shadid’s answer is to thoroughly study new public projects and have a financial plan in place to pay for the maintenance and operations costs before presenting these projects to voters on their next ballot. There’s also the problem of developers and communities competing against each other for government dollars. Shadid pointed to the roads and sidewalks that have been built where there’s hardly anyone traveling by car or foot, let alone actually living on empty lots where new housing additions will eventually be constructed. Yet this road and sidewalk spending is happening all while the city struggles to fill potholes in its already established neighborhoods and districts. It’s a cycle of repetitive neglect in some cases. Take for instance the troubling number of Oklahoma City Police officers there are: 963. Shadid said that is the same number of officers OKC had 20 years ago, only now there is 150,000 more people spread out over a much greater area. Neighborhoods don’t feel safe because crime has been growing and they can’t get officers to regularly patrol their streets. He said it is virtually impossible to address all the city’s security needs given the low number of police officers. Shadid said the mayor wouldn’t hammer out an agreement with OKCPD, but as mayor he would meet with OKCPD however many times it took to figure out how to bring on more police officers to better improve public safety in the city. Related to crime was his point on Oklahoma’s female incarceration rate, as we have the highest in the nation. Statistically many of these women, a high percentage are non violent offenders, have suffered sexual or domestic abuse. The cycle of abuse and violence leads to crime, drug abuse mainly. There’s also poverty and homelessness to contend with, problems Shadid says he has a plan to address should he become the next mayor of Oklahoma City. You can listen to his entire speech via our SoundCloud embed below, but I want to move onto who I saw at the rally: a very diverse group of people. Many I know because of stories I’ve written or had covered for this very publication. In some way each of these groups have had contact with Shadid because he reached out to them. He met with them to understand their unique position in the community and hear about what issues effect them most. I even met a Norman resident at this rally too. Stephen Holman said he came to hear Shadid speak because he wants to better know each candidate and what their platforms are. Even though Holman can’t vote for the next mayor, he said he has a vested interest in what is happening right now, because the direction OKC takes next will without doubt effect the greater metropolitan area, which includes Norman. 2014 is going to prove a very important election year for the OKC metro area. While only 96% of the population came out to vote in the last mayoral race, I think given the number of people who showed up at Shadid’s launch rally this far away from the actual election is indicative of the kind of political momentum stirring around the city at this point in time. I think change begets change. People see parts of the city, like The Plaza District, revitalizing what was once urban decay into a thriving and prosperous community, and they want that in their neighborhoods too. You know, I’ve been keeping tabs on OKC since 1999. I went off to college and when I wasn’t working or going to class, I would sometimes go out for a drive and find myself wandering Oklahoma City just to explore it. Later when I became a wife and mother, I got reacquainted with OKC because of what it had to offer families. Now I’m looking at it from the role of a working creative with a business located here. I’ve watch it change and grow, and in some ways remain stagnate. Still I see potential. Oklahoma City is like a beacon to those of us who are enthusiastic enough to take on the challenges that come with economic opportunity, renewal, and growth. And because the recession forced many of us who would leave to stay, or those of us who left to come back, I think the demand for improved public services and sustainable progress is a given. People want a better quality of life and a local government that cares about making sound choices. They want what other cities elsewhere have had for years, and I think most are tired of waiting for Oklahoma politics to catch up. I’ll leave off with one of the more striking performances of the night after Shadid’s speech, of course. Poet Lauren Zuniga spoke to the crowd. She said she believed Oklahoma City had “the capacity to be an incubator for the most creative minds the world has ever seen” and “the capacity to be the kind city people long to be from,” confessing in the process that she’s had more than a few times where all she wanted to do was leave. Naturally there were those in the crowd who understood her frustration. She also read a tweaked version of her poem “To The Oklahoma Progressives Plotting Mass Exodus.” Name checked in the new version were the Plaza District and the Old Farmers Market District. The poem ends by encouraging those who want to see change, to stay and be a part of making it happen. Zuniga doesn’t outline how to “make it happen” in detail, but I’ll tell you this much: the first step is getting educated on the issues. The next one requires you to step into a voting booth on March 4, 2014 and make an informed decision. You can check for more photos of the rally here too. All photos by Brandon Isaak. Tagged Brandon Isaak, City Councilmen Ed Shadid, community, Ed Shadid, Lauren Zuniga, norman, OKC, OKCPD, Oklahoma City, Oklahoma City Metro, Oklahoma City Police, Old Farmers Market District, Old Farmers Market Public, Poet Lauren Zuniga, seen, Soundcloud, Stephen Holman. Bookmark the permalink. OUTSTANDING CANDIDATE. LET’S GET HIM ELECTES TO HAVE A ” PUBLIC OFFICIAL” THAT ACTUALLY REPRESENTS THE CITIZENS AND TAXPAYERS . LET’S GET HIM ELECTED TO HAVE A PUBLIC OFFICIAL THAT ACTUALLY REPRESENTS WE CITIZENS AND TAXPAYERS. Your writing is very clear and concise. Oklahoma City is lucky to have you in its midst. Ed Shadid’s rally sounded exciting. I’ve lived in OKC for 39 years and I can’t recall the election for mayor ever having a real selection of candidates to choose from–until this year. However, the Chamber of Commerce, Cornett’s campaign, and all the cronies in high places Cornett has developed over the years will throw everything they’ve got–money, aspersions, ethnic slurs, and other calumnies–at Dr. Shadid hoping to persuade the rednecks to vote again against their best interests.